The Montreal Museum of Fine Arts (MMFA) is presenting for the first time in Canada Another Feather in Her Bonnet (2017), a performance video by Toronto-based Cree artist Kent Monkman, with the special participation of French fashion designer Jean Paul Gaultier. This video portrays the symbolic “marriage” of Miss Chief Eagle Testickle, Monkman’s shape-shifting, time-travelling, gender-fluid alter ego, and Jean Paul Gaultier, two fervent advocates of sexual diversity. The MMFA’s presentation also includes Monkman’s installation Théâtre de Cristal (2017), recently donated by the artist to the Museum. On September 8, 2017, at the invitation of the MMFA and with the special participation of Jean Paul Gaultier, Kent Monkman gave a performance in connection with the exhibition Love Is Love: Wedding Bliss for All à la Jean Paul Gaultier. From this performance, Monkman made a classic wedding video, capturing and challenging all the clichés of Western cis-gendered heterosexual romantic love: Another Feather in Her Bonnet (2017), now being released to the public. 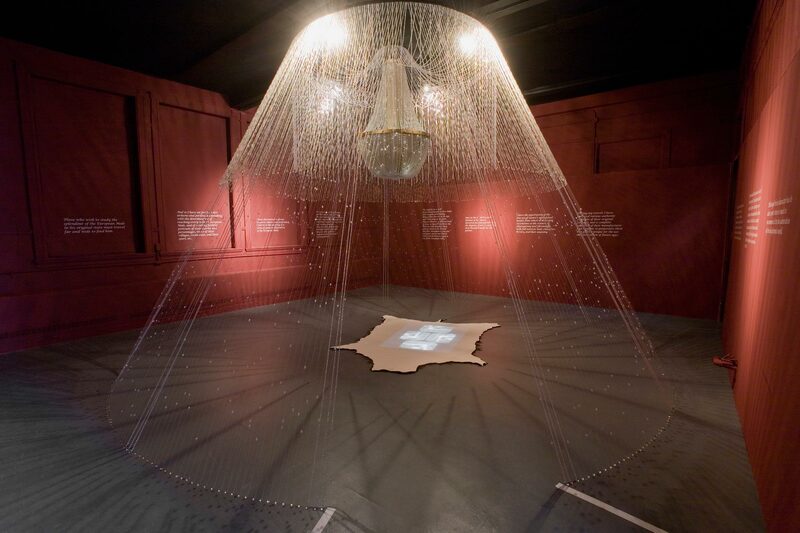 The performance takes place inside the glass beaded tipi Monkman made for his installation Théâtre de Cristal and features the inclusive and committed union between the “enfant terrible of fashion” and Miss Chief Eagle Testickle. The artists exchange vows of mutual respect and friendship in the presence of two witnesses, Nathalie Bondil, the MMFA’s Director General and Chief Curator, and Thierry-Maxime Loriot, curator of the exhibition Love Is Love. 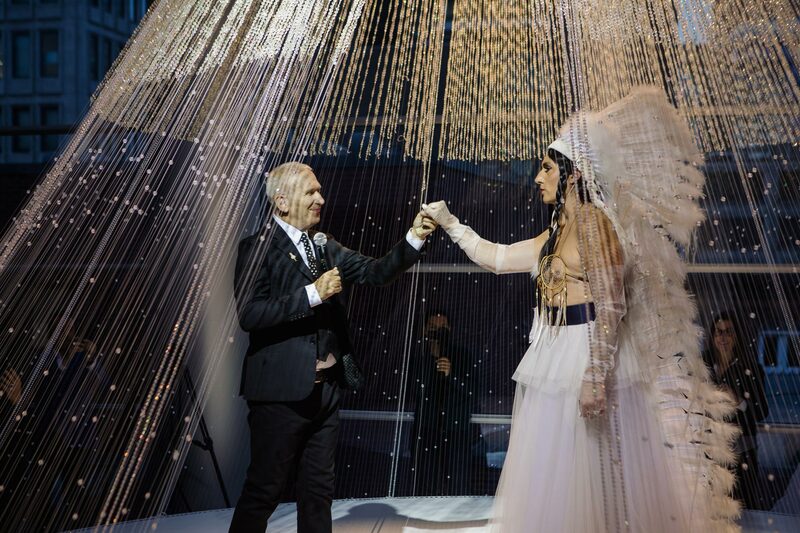 Actor Andrew Schiver plays the part of the officiant, and Ève Salvail, Gaultier’s muse and model, that of the maid of honour. For the faux ceremony, Miss Chief wears a white feather headdress created by Gaultier for the wedding gown of the 2002-2003 fall-winter haute couture collection The Hussars. Inspired by headdresses of Indigenous peoples of the Plains, this headdress was originally displayed in the exhibition Love Is Love: Wedding Bliss for All à la Jean Paul Gaultier. In the context of the debate over cultural appropriation, the presence of this headdress in the exhibition demanded a response, so the MMFA invited Monkman to create an artistic commentary. His reply: Miss Chief would gracefully accept Jean Paul Gaultier’s hand in marriage. With his long-time collaborator Gisèle Gordon, Monkman designed this performance to be a symbolic union that represents two artists coming together to challenge ideas of cultural appropriation and build an artistic union based on mutual affection and greater cultural understanding. “Through the alliance of marriage, we learn to understand and forgive the mistakes of our partners and to build true understanding. Marriage encourages and nurtures new life, new experiences. Today, Miss Chief accepts Jean Paul Gaultier’s proposal of artistic union as an aesthetic alliance leading to mutual respect and cultural understanding,” said Kent Monkman. Indigenous headdresses are imbued with spiritual significance. An earned honour, they come with protocols and responsibilities. Monkman’s artistic claiming of this faux headdress speaks to the broader stereotype of the Indigenous woman as perceived by the colonial gaze. Through Miss Chief Eagle Testickle, Monkman evokes the gender-fluid and/or two-spirit people venerated and accepted by most pre-contact Indigenous nations, whose cross-dressing ways scandalized and were suppressed by European colonists. As an accompaniment to the performance, Monkman collaborated with Toronto photographer Chris Chapman to create wedding-portrait style photographic art pieces of Miss Chief and Jean Paul Gaultier, adopting the style and presentation of the 19th century French cabinet card format. The video performance Another Feather in Her Bonnet (duration 5 min. 2 sec.) was produced in collaboration with the Montreal Museum of Fine Arts and Maison Jean Paul Gaultier. Jean Paul Gaultier and Miss Chief Eagle Testickle (Kent Monkman), Montreal Museum of Fine Arts, September 8, 2017. Photo: Frédéric Faddoul.